Is your company in need of a reliable HMI (Human Machine Interface) for the workplace? The G3 Series by Red Lion provides complete HMI functionality for PLCs, motor drives and other devices developed for communications. All G3 models come with standard Ethernet for enabling networking capabilities on any serial devices that are connected to the panel. There’s also the G3 Kadet Series of operator panels if you need an HMI for less demanding applications. Red Lion controls and products are of high quality, with added value to meet the needs of industrial and other workplaces today. 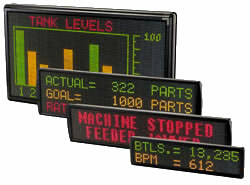 Red Lion products are available for a variety of control and monitoring applications. Carotron is a distributor for Red Lion, and we are always available to answer your questions about Red Lion and other available products. Call Carotron today to discuss your needs!